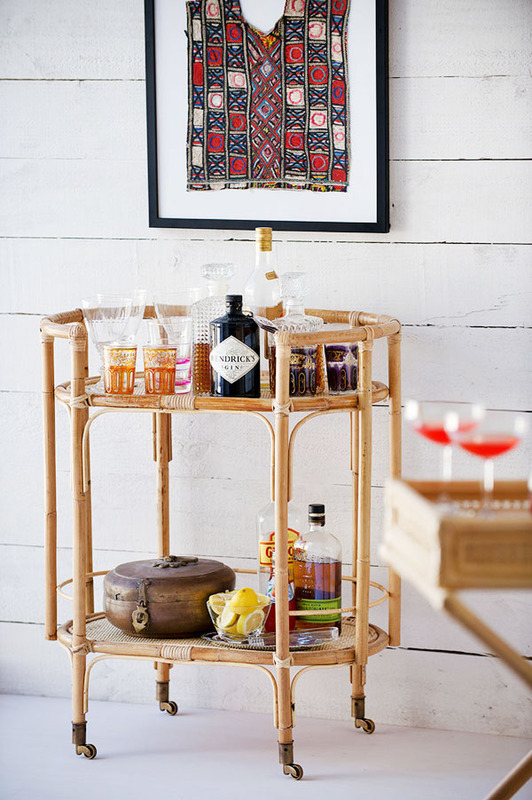 Anyway, bar carts, drinks trolleys, hostess trolleys…whatever you call them, they are a big deal at the moment, and have been for a while. In a more realistic world, even 3 years ago they were popping up from home magazines and into my subconscious without me even realising it. As you can – kind of – see, it’s wooden and stained a nasty dark mahogany type colour which is the first problem, because a lot of my favourite designs are metal (remember my post on Brass having a comeback?! ), so I’m not sure whether to spray paint it a metallic or crazy colour gloss to go all out glam-gin-palace. Or, maybe I should painstakingly sand it back to the nice-ish light wood underneath the stain and keep it quite boho-rustic looking. Maybe I should tile the tops of the shelves to inject some pattern and interest… I don’t know, so I just haven’t, basically. This is another level of bar area all together – imagine dedicating a whole wall to your favourite tipple?! Unsurprisingly, I love this Mid-Century colour combo of blue, yellow and brass! 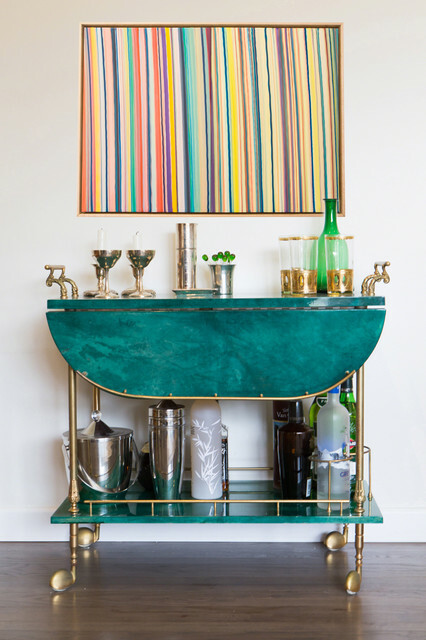 This trolley is actually made of a faux-malachite and the whole thing just glistens, looking like precious stone. 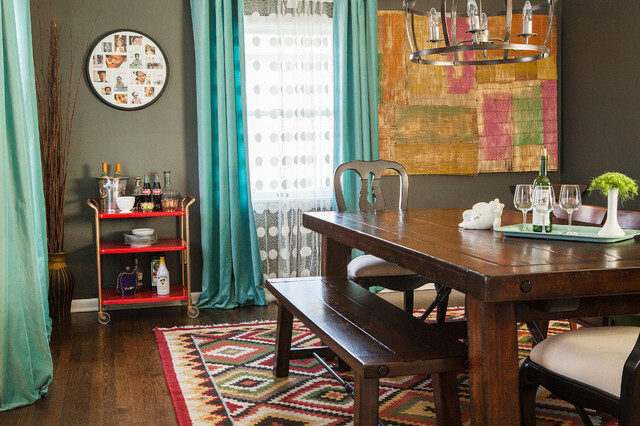 I really like it against the white walls and how it highlights the turquoise in the painting above. There are quite a few rattan offerings around, and this one is full on tropical tiki bar style! I love it, just screams for Pina Coladas and drinks with umbrellas in! I really like how dainty this one looks, when combined with the chunky wood furniture; the bright colour makes it stand out even in quite a big room with a lot of other stuff going on. It’s strange how refreshing it feels to see some silver! I like the slightly more edgy, industrial feel about this one. Check this out!! This one would bring some serious wow-factor to your space, and I love it here paired with the pale walls and floors, it looks very elegant and feminine. I know this picture isn’t entirely inspiring, but I really like this little guy. A bit of an industrial edge which I like, and the rails around the edges will stop anything falling off if you’re a bit too enthusiastic with your wheeling! I imagine it in a simple, Scandi (dare I say ‘Hugge’) monochrome scheme. So there you have it, a round up of a trend which has been going for at least 4 years so far, and doesn’t show any signs of slowing down or going anywhere. If you’re not wanting to spend too much on one, I’d suggest doing what I did and checking out charity shops and car boot sales… and then doing what I haven’t yet – a bit of up-cycling! 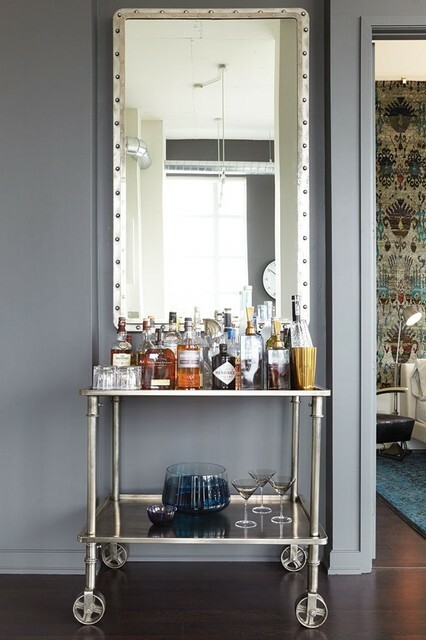 This entry was posted in Inspiration, Our House and tagged bar carts, boho, brass, DIY, drinks trolleys, home decor, industrial, Inspiration, interior design, interior trends, interiors, mid century, rustic, upcycling, woodwork. Bookmark the permalink.